For those who want to catch up or keep up on their theology (and why wouldn’t we want to study the meat of the Word?) these (three) volumes of selected writings by various theologians throughout the church age is a good exercise. 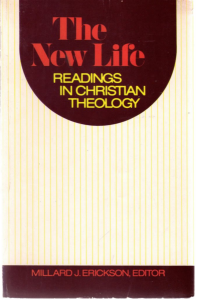 Erickson (author of the most valuable Christian Theology and professor of theology at Bethel Theological Seminary) gives the reader a broad spectrum of views on several major issues. Volume I, ‘‘The Living God,’’ gives you writings on ‘‘Who God Is’’ from men such as Thomas Aquinas, Karl Barth and John Calvin to Kenneth Kantzer, William Hordern and Bernard Ramm. Even the sections by liberals such as Rudolf Bultmann on ‘‘Demythologizing the New Testament Proclamation’’ remind us that twentieth century lost men are repeating the same old arguments of lost men generations ago.